In late September news trickled out about a change in Facebook’s EdgeRank algorithm that was causing big drops in reach for many branded pages for nonprofits, businesses and all organizations. The EdgeRank algorithm determines which posts are displayed in the newsfeed and in what priority order. Noticing a clear decrease in the reach and virality of pages, Beth Kanter took to Facebook to see if many nonprofits had experienced it. She received a number of replies affirming the dropoff, while others, like John Haydon at Socialbrite, say the evidence doesn’t support that claim. What seems to have changed? Both EdgeRank Checker and Post Rocket have good posts on the details, but in a nutshell, Facebook has altered the way it displays posts in the newsfeed to prioritize posts that have the greatest number of interactions – a cumulative figure determined by the number of clicks, likes, comments and shares a post receives. The new algorithm also factors in negative feedback and penalizes posts that have been actively hidden by viewers or reported as spam. 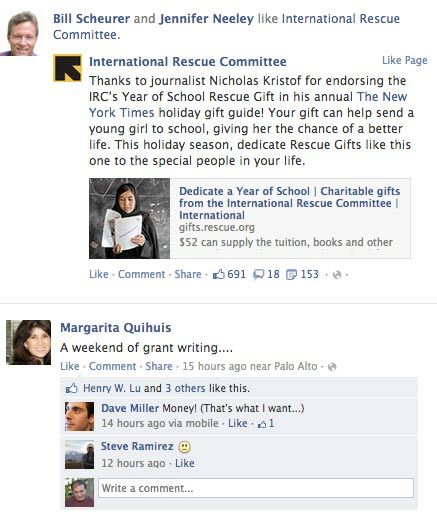 Regardless of whether Facebook’s code tweaking is having an impact on your fans’ newsfeeds, the real question now is: Short of paying for promoted posts, what can nonprofits do to adjust to these changes and make sure their content earns the sort of reach and virality needed to engage new volunteers, donors and advocates? Here are a few tips to keep in mind to help your content remain top-of-stream. 1The major point that emerges from Facebook’s explanation of the new algorithm is that posts with the most positive engagement in the form of clicks, likes, comments and shares will appear more often in the newsfeed, resulting in higher reach and virality. This could be a good thing for Facebook users. As more and more brands have ramped up their presence on Facebook, the newsfeed has become increasingly cluttered with content. The algorithm change was designed, at least in part, to reduce the noise in an individual’s newsfeed and give more prominence to really good content. How to leverage it: Take 30 minutes to audit your content that has done well in the past on Facebook. Put your top content through each of the following questions and see where trends emerge. What common traits do the posts have in terms of subject matter or format? What tone did each of your top shares have? Were they urgent? Funny? Or did they raise questions for response? What was the call to action, if any? In her recent book “Measuring the Networked Nonprofit,” Beth Kanter talks about a ladder of engagement, with smaller actions laying the foundation for larger ones. Where in the ladder of engagement would you place the calls to action of your top posts? Once you have laid out your top posts and examined their tone, content and format, use any themes that emerged to map out your future posts. 2Because so much of the new algorithm depends on early activity, timing is just as important as content. In 2011, HubSpot’s Dan Zarrella conducted extensive research on the topic of social media timing. He studied more than 1.3 million posts from the 10,000 most-Liked Facebook pages to glean some larger trends in the timing of social shares. What he found for Facebook was that shares on average had the highest rate of activity during the weekend. It’s easy to forget about posting on weekends, but weekends are prime-time for engagement with newsfeed posts. Many offices still block Facebook during the workweek. Even for those who allow it, the weekend allows more time for individuals to browse and interact with posts. How to leverage it: Use a social media scheduler to line up posts for the weekend. See How to schedule a Facebook page update, and see what kind of activity you get. Don’t rely on HubSpot’s research alone, however. Conduct your own experiments to see what days and times tend to see the highest activity within your office. Pull your top posts and see if any trends emerge in the timing of those with the most interaction. Similarly, pull posts that saw no engagement and try to identify black holes in your sharing schedule to avoid in the future. 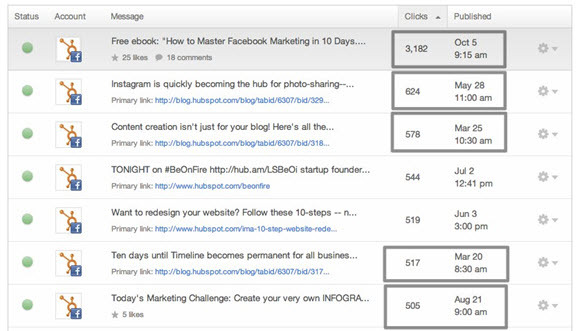 Here’s a look at HubSpot’s analysis, which I pulled together for this post. 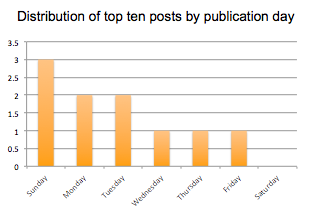 As you can see, our posts seem to generate the most activity on Sunday, followed shortly after by Monday and Tuesday. We garner lower engagement toward the end of the week. I also took a look at the time of day when activity is highest for us. Sorted below in the HubSpot social media tool, you can see that we have had good success sharing content with our audience in the mornings. 3In addition to auditing what’s working with your shares, take a look at what would motivate a user to hide, hide-all or unlike your content. Hiding content is tantamount to deleting an email without reading it. Hiding-all is the equivalent of unsubscribing, and unliking closes the relationship entirely. In Facebook’s new algorithm, content that has negative feedback from some users can cause it to be minimized or pulled from all news feeds. Take a look at what could be causing people to hide or unlike your content. Are you posting too frequently? Try altering your schedule to add more space between your posts. Are you asking for too much? Compare posts with different calls to action to see what types cause hides or low engagement. 4Our research and our day-to-day experience shows that images and videos tend to have much higher engagement than text-only posts or links. 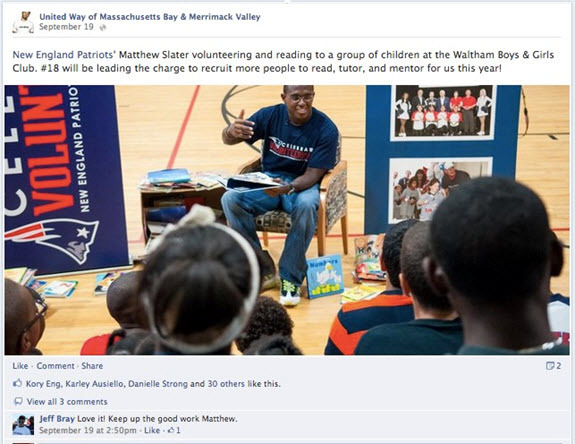 Make sure you’ve got a healthy mix of images Below, an image from United Way of Massachusetts Bay & Merrimack Valley (an organization I support) shows the value of volunteering. The image resulted in 30 likes and 3 comments, among the highest levels of engagement on their page. Want to make an image even stronger? Couple it with a relevant link to your volunteer page or another call to action. 6One sure-fire way for your top supporter to see all of your organization’s shares is to encourage them to add you to an interest list. Interest lists on Facebook organize all of your favorite topics and keep you from missing posts. Even better, if the interest list is left public, others can subscribe it – expanding your reach. You can create your own interest list with partner organizations or nonprofits in your geographic area, then encourage others to subscribe to it. Lists turn Facebook into a media consumption channel in addition to a social network. This was not the first adjustment Facebook has made and it likely won’t be the last. The best response to this and any change from a third party platform is to dissect what drives the change and determine how your social media strategy can best adapt to accommodate it. Early on, the algorithm change raised concerns that purchasing promoted posts would be the only reliable way to maintain a presence in the Facebook newsfeed. But a closer look at the character of the change reveals a number of methods that nonprofits can use remain on top without having to dip into vital funds. Even with algorithm changes, the main tenet of social shares remains true: Interesting, remarkable content will always rise to the top. Meghan Keaney Anderson is a product marketing manager at HubSpot. She writes on technology, writing and social innovation and can be found on Twitter at @MeghKeaney. This article originally appeared on Beth’s Blog.